3DFlagchy - Flag for #3DBenchy by DrLex is licensed under the Creative Commons - Attribution license. Ever wondered what the tiny hole at the rear of #3DBenchy is for? This is a tiny flag pole that will print in a matter of minutes, and theoretically will fit in the hole. It allows to spiff up your arsenal of test prints, and also test your printer's accuracy in the process. In practice, the average FDM printer will likely have problems printing the hole at exact dimensions, and it is also likely that the flag pole will be slightly too thick. So, be prepared to either sand or scrape the pole, or enlarge the hole with a 2 mm drill. On a perfect printer, the pole would even be a rather loose fit and you would need to scale up the flag model by about 15% in the Z axis to get a tight fit. 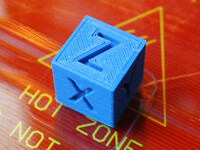 Separate parts for a dual extrusion (probably the smallest one you'll ever print) are also provided. This should print fine without a raft, despite the tiny contact surface. 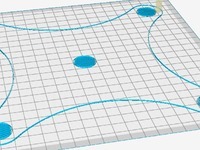 If you would scale this up, it may become necessary to use support material for the waving flag, although it should work fine without, if you have proper cooling. I have also provided models with the flag pointing upwards (‘flagUp’ files). This may be problematic to print at normal scale, but could be easier to print at larger scales. Added ‘flagUp’ models that can be printed with the flag pointing upwards.